"The Old Plantation," painting by John Rose, ca. 1785-1795, courtesy of the Abbey Aldrich Rockefeller Art Museum. 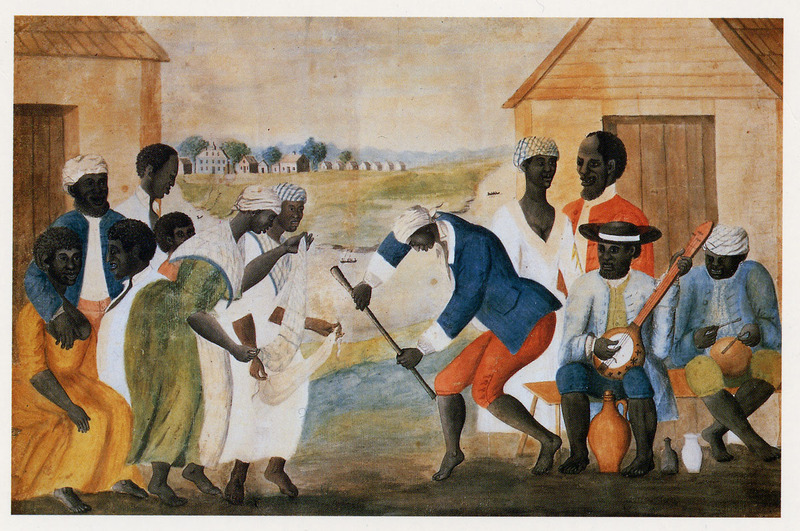 This painting depicts enslaved African Americans on a plantation in the South Carolina Lowcountry. African Passages, Lowcountry Adaptations (APLA) is an online exhibition about the systems of chattel slavery and plantation agriculture that developed in the Atlantic World, and that would come to define race, class, and labor experiences in Charleston and the surrouding South Carolina Lowcountry region from the seventeenth to the nineteenth centuries. After Emancipation, legacies of race and class inequalities that stemmed from slavery continue to be a struggle into the present. The histories of slavery in the Atlantic World, North America, and the South Carolina Lowcountry presented in this exhibition are complex and connect to various ongoing scholarly debates. In addition, many of the historic sources and visual depictions of early African, African American, and American Indian history available for scholarly research and exhibits today were produced by Europeans and Euro Americans. They often reflect bias towards Eurocentric worldviews and priorities. Despite these challenges, this exhibition seeks to provide a broad outline of historic developments, events, and issues connected to the development of slavery in the Americas, particularly in the South Carolina Lowcountry region. We encourage readers to explore the Sources section for more in-depth works on the histories summarized here. Our goal is to provide insights that raise questions and encourage awareness, rather than produce a definitive narrative of this complex history. APLA features digitally archived multimedia materials from the collections of the Lowcountry Digital Library and various other online repositories, and links to numerous relevant digital projects and resources. Using Omeka's flexible exhibit builder program, we hope to continue to enhance multimedia materials and resources featured in this exhibition. The Lowcountry Digital Library (LCDL) at the College of Charleston collaboratively developed this digital exhibition project for the Lowcountry Digital History Initiative with various scholars and partners listed within the Sources section. Project development and implementation was made possible by grants from the Humanities Council SC and the Gaylord and Dorothy Donnelley Foundation, and with support from the International African American Museum (IAAM) and the Avery Research Center for African American History and Culture.